A blue machine glides silently on the gentle waters. It has sharp, angular features and a red underbelly submerged under water. As it glides, the craft picks up speed with the water forming a white v shape below the machine. The red underbelly lifts off the water and the machine, with the help of its mechanical wings, it takes flight into the skies. 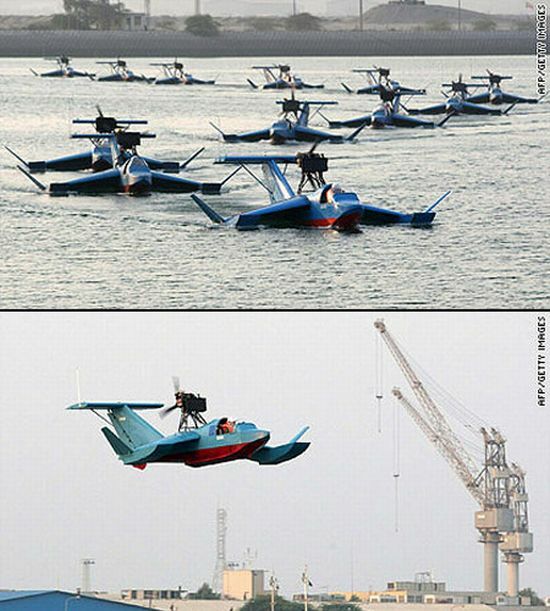 The blue machine is a flying boat developed by Iran for military purposes and is called ‘Bavar 2’. Over the years, the Islamic Republic of Iran has been in the spotlight for developing nuclear weapons and other weapons capable of mass destruction. Bavar 2 is the latest military-related development that Iran has displayed to the world. From a technological viewpoint, the Bavar 2 reflects the latest innovations of modern military aircrafts. The flying boat has a specialized hull that makes it undetectable by radar. The aircraft has the capacity to be armed and can carry a machine gun or missile attachments. A distinct feature of Bavar 2 is the positioning of its propeller. A majority of aircrafts have propellers placed below its wings. Not the Bavar 2. The Iranian stealth aircraft has a single propeller placed on the central bridge of the craft, between the cockpit and the tail. The single propeller is placed sideways and rests on a durable tripod. The Bavar 2 can float, fly, and carry weapons, but its most important function is surveillance. With a hull that is undetectable radar, the aircraft would be used to survey its borders and keep an eye on meddlesome neighbors. Surveillance cameras can be attached to the nose of the flying boat. Iran has proudly showcased its fleet of stealth flying boats to the world media at a time when the country is celebrating its annual ‘Week of Sacred Defense’. The Sacred Defense Week is an event that commemorates the country’s eight-year long war with Iraq between September 1980 to August 1988. Political commentators have viewed the unveiling of the flying boats, at this particular event, as a reminder by Iran that they are not to be messed with. Politics aside, the internet has been abuzz with views and opinions flowing freely from netizens. Many have poked gentle fun at the flying boats ‘kit like’ construction. According to bloggers, the Bavar 2 looks like a craft that anyone could have assembled themselves. In all seriousness, the Bavar 2 is a remarkable achievement for a nation that, in many ways, is rebuilding itself into a modern state. If this has impressed you, don’t forget to check out Futuristic Unmanned Helicopters and Moller Skycar M400.